How does high approval ratings translate into effectiveness when there is an opposition party? Please explain that metric to me. Doesn't the party of the presidency lose the congress much of the time? My very brief research shows that it does - ALMOST ALL THE TIME. In fact the president's party only gained seats twice in the last ~100 years. "...the president's party beat the odds and gained in 1934 and 2002. In 1934 -- two years into Franklin D. Roosevelt's presidency, in the midst of the Great Depression -- Roosevelt's Democratic Party gained nine House seats and 10 Senate seats. And in 2002, roughly a year after the terrorist attacks of Sept. 11, 2001, President George W. Bush's Republican Party gained eight House seats and two Senate seats." So how does this square with your claim that it was "on Obama?" How do you know he didn't get anything he promised? What are the numbers there? I've read that he was successful on a lot of his promises - breaking promises 24% of the time. That he didn't try, that he was lazy? What is your basis for there value judgments? It certainly isn't what you posted. 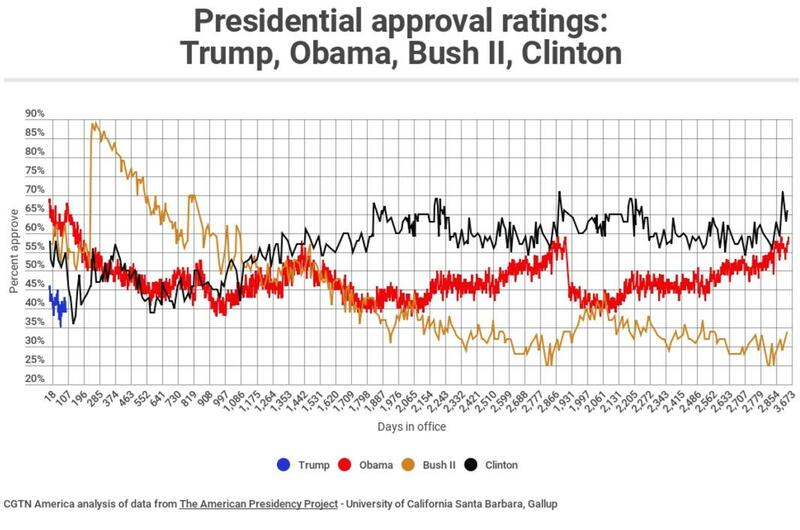 Last edited by blktoptrvl; 04-01-2018 at 03:38 PM..
... also, how do these approval ratings translate into anything you are complaining about? As far as I can tell, you have NO valid arguments to support your FEELINGS about President Obama. The "facts" you post have no correlation to anything you seem to be saying. Last edited by blktoptrvl; 04-01-2018 at 04:38 PM.. Working 1% is nowhere close to 100%. It's a failure. I propose we go after the reason people come here. The employers. The 1% number you made up? Based on 30 million, which I last remember being 11 million. And my point being that, for example the wall is shot down because it won't stop 100% of illegal aliens because something like 50% are visa over stay. Anyway, I completely agree with going after employers, I'm with you 100% there. California should lead the way, being that they house the majority of illegal aliens. It is NOT California's job. It's the federal governments. Always excuses for everything.......Trump, Obama, it's all the same. Why is it that when I idea comes up it has to work 100% or don't try. Of course you can't suddenly capture and deport 30 million (is 30 now? I thought it was 11), why even suggest that. You sound pessimistic about the current efforts to deport illegal aliens, what are you proposing we do? No one is talking about kicking in doors and rounding up millions of illegals. Make life so tough for them that they leave on their own accord. Some people are pessimistic and like to lie down, roll over and wave the white flag of surrender. In other words, they want to capitulate to the illegals, rather than get tough and enforce our immigration laws. We don’t owe anything to people here illegally . There is no law that says we have to let anyone come here if they want to . It’s not in the Bible either . It’s gotten to the point where millions are exploiting our weak borders and weak enforcement of laws . Illegals only have themselves to blame for any crackdown . Trump is being painted as some cruel person simply for wanting immigration laws enforced . There are many valid reasons to want immigration laws enforced . For crime and also the money aspect . We need to focus on America and Americans again . There is no crackdown. There can't be unless one goes after the employers. Be sure to let us know when our employment laws get enforced. Of course its not the states job, it makes no sense to intentionally put barriers up between states and feds when we agree on people invading our country. It's like putting barriers between state and DEA because they don't agree on weed, or state and ATF because they don't agree on what is a gun. You and I agree. Let's go after employers, hard. Since CA houses the most illegala they should be at the forefront of pushing this. Amen. If anyone actually wanted to do something about illegal immigration this would be the mantra of their preaching.